Valentine's Day has snuck up on you once again and you're sitting there with no idea what to get her? Well this post is your saving grace. This post is not only for the boys wondering what to purchase their girlfriend, but you're probably a daughter, sister or mother and are looking to buy the special women in your life something special to show you acknowledge them on this day of love. 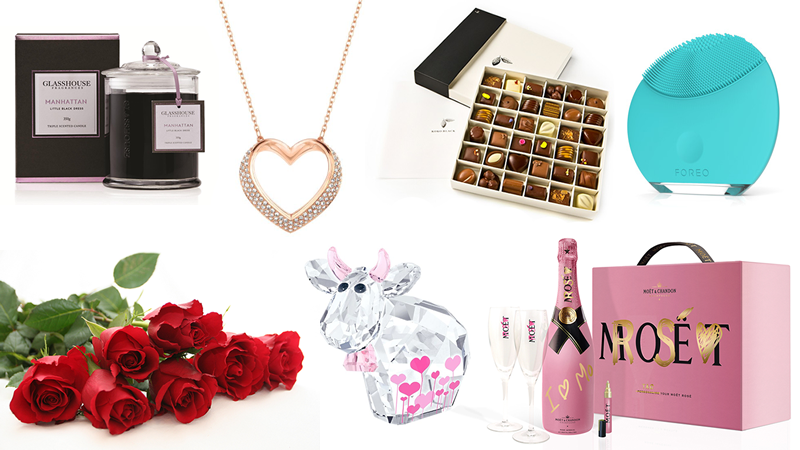 This is kind of my very own wish list so an insight into what a girly girl wants this Valentine's Day. Most girls love candles, I mean who doesn't enjoy a beautiful scent filling their house right? Glasshouse are the king of all candles and have a strong scent that you can even smell through the packaging or without even lighting it. This is a sure winner for a small gift this Valentine's to show you appreciate her. You can purchase this product here. If you want to get her a nice piece of jewellery then this is it because it doesn't break the budget but still sparkles like real diamonds. I love how delicate and feminine this piece is and I am sure that most girls would love this beautiful necklace. There is no going wrong with a delicious box of chocolates, especially these yummy gourmet ones from Koko Black. By giving her so many options within the one box, she is bound to find a few that she loves and you never know, she might share some with you. You can purchase this product here. If the woman you are buying for is into her skincare then this is a product you can not go past. It is definitely up there with all of the high end skincare items and will treat her skin to a spa like experience every day. If you are really looking to splurge then you can spend a bit extra and buy her the full sized version which is a bit larger than the mini. You can purchase this product here. Every girl secretly wants roses on Valentine's Day. there's something so loving about giving a dozen of these absolutely beautiful flowers. Similar to the chocolates, it's just something you can't go wrong with. Attach a beautiful note to them or include a card and this would make the perfect thoughtful gift without having to spend a lot. If the woman you are buying for loves sparkly things or is a huge fan of Swarovski then this will make her squeal when she opens it. These crystals sparkle like no other and it would look perfect on her desk at work or displayed on her vanity at home. This is a cheaper alternative to the necklace shown previously but still makes a great impact. You can purchase this product here. What better way to end Valentine's Day than with a glass of bubbly and this is the most beautiful themed set I have seen. It comes with a gold pen so that you can write love notes on the packaging and bottle, making for a perfect activity to play around with together. This set is available from selected bottle shops. Now that you have the perfect gift for her, don't forget to pick up a card and write down everything you love about the person you are giving the gift to. The whole holiday is based around appreciating those you love and your words will say more than any gift ever will.